There are two ghost stories associated with Inverawe House: that of Green Jean and the ghost of Ticonderoga. One of the most famous Scottish ghost stories began at Inverawe and ended on the other side of the Atlantic, in North America in 1758. One day Duncan Campbell, Laird of Inverawe, was in the hall when a man burst in and touching the hearthstone, claimed sanctuary, explaining that he had killed a man and was on the run. Keeping true to the unwritten law of the Highlands, that sanctuary must be given to any man who touches your hearthstone, Inverawe duly hid the man. A short time later the stranger's pursuers arrived. Inverawe was horrified to learn that it was his foster-brother who had been killed, but he stuck to his oath and did not give the murderer away. That night as he tossed and turned, the ghost of his foster-brother appeared, imploring him to give up the murderer but Inverawe was honour bound and was forced to refuse. During a second harrowing night the ghost appeared again demanding Inverawe give up his murderer: "Inverawe, shield not the murderer, blood must flow for blood." Again Inverawe could not break his oath. Inverawe could stand having the murderer under his roof no longer. He took the wretch to a safe cave on Cruachan, promising to bring him food and water the next day. The next day, the cave was empty; the man had fled. That night the ghost appeared for the last time, saying to Duncan "Farewell, we meet again at Ticonderoga." The name meant nothing to Duncan and as the years passed it went out of his mind. He joined the army and rose to be second-in-command of the famous Black Watch, with whom he went to America to fight the French. The British Army advanced north from New York and finally came up against the enemy at Fort Carillon on Lake George in 1758. The evening before the attack, Inverawe received another visit from his foster-brother's ghost. Inverawe knew that his fate was sealed, for the Indian name for Fort Carillon was 'Ticonderoga'. The next day a fierce and bloody battle was fought, but the French position gave them the advantage from the start. Finally the remnants of the 42nd retreated. Among their heavy casualties was Major Duncan Campbell; mortally wounded, he died ten days later. Inverawe never returned to Scotland and was buried near the site of the battle. His grave stone still remains. 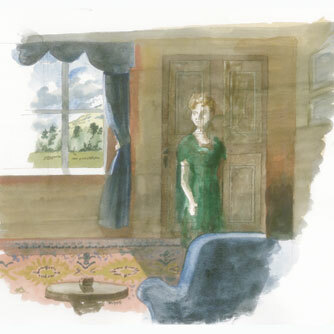 The ghost of a woman, with golden hair and wearing a long green dress, has been seen many times at Inverawe. Known as 'Green Jean' one theory is that she is Mary Cameron, the Maid of Callart, once engaged to young Inverawe. She contracted the plague and her adoring fiancé took her to a cave on Cruachan where he looked after her until she had recovered. The late Captain of Dunstaffnage, who was living at Inverawe at the beginning of the last century, told how when he was standing in the hall at Inverawe putting up a fishing rod, he glanced upward at the tip of the rod and to his astonishment saw a girl in a green dress walking along the gallery that overlooked the hall. The girl had beautiful fair hair, and looked to be about sixteen years of age. Having reached the end of the passage she passed into what is known as the Ticonderoga room and was not seen again. The Captain also told how in 1912 on the night before he and his mother left Inverawe, before the arrival of the new owners, loud screams were heard coming from the empty Ticonderoga room. This disturbance was believed to have been caused by Green Jean going into the room and finding it stripped of all its accustomed furnishings. 'Green Jean' has also been seen outside the house. A shepherd was astonished to see her ghost and even more astonished to see his sheep actually making way for her as she passed through their ranks. On another occasion she is said to have scared workers at the nearby hydro-electric project when she was seen walking along the road towards the house, where, in full view of the men, she vanished. Robert Ross told how, in the 1950s, when he and his wife were opening up the house prior to the owner's arrival, the door of a room in which they were working opened silently and when he called out "Who is there?" the door shut again without a sound. In August 1967, the late Brigadier Lorne Campbell of Airds VC, while a guest staying in the house, was woken in the middle of the night by a hand on his shoulder which turned him over as if to look at his face. He called out but there was no answer: the room was empty. The last sightings were in 2001 when part of the house was being re-roofed. We can only assume that the building work disturbed the lady. There were two sightings: one on the landing of a woman in a long dress and one in the smoking room of a woman searching in a cupboard. Both were seen on the same night by different people. A third guest in the house was kept awake all night by banging doors and footsteps rushing up and down the stairs. Once the roof was completed all was quiet with no more disturbances. And today, there are still doors opening and shutting, items missing and turning up again in previously searched places, odd noises with no-one there. But the ghost is never frightening and she is well disposed to all Campbells in particular.